BYOD is an acronym for Bring Your Own Device. It refers to learners’ bringing their own devices into the classroom for learning, such as smartphones and tablets, as opposed to using an organisation’s own devices (typically desktop PCs). Learners’ own devices, particularly mobile phones, are often seen as a distraction in the classroom. A wide range of applications are available that enable these devices to be used as a tool for engaging learners and enhancing learning. Examples of such applications include real-time assessment apps (Socrative, Kahoot! ), QR code apps (QR code treasure hunt generator) and interactive video apps (Zaption, Vialogues, TED-Ed Lessons). BYOD has become a viable alternative to classroom computers in my organisation only in the last couple of years. This has been the result of the increase in the number of students who own smartphones with Internet access and the increasing availability of reliable and affordable connections to the Internet via mobile devices (the wifi at my organisation is still relatively slow and unreliable). So how do BYOD apps engage learners? Those of us who enjoy playing video games know how even the simplest games can keep us hooked and how the quickly the hours can fly by, tapping on your screen or clicking the buttons on your mouse or game controller. The question of how BYOD apps engage students can be summed up with one (buzz)word: gamification. It’s not a word I’m particulary keen on, but it encapsulates what BYOD apps do; they bring elements of gaming, particularly that of video games, to engage users. Examples of such elements include a reward system such as point scoring or achievements, increasing levels of difficulty, eye catching graphics, animated graphics and catchy music. These elements often introduce an element of competition to the activity. Many of these elements can be found in Kahoot!, a real-time assessment app. What? BYOD apps can enhance learning too? Finding an activity that engages learners is enough to make many teachers happy. But many BYOD apps take things one step further and can also enhance learning! Let’s look at one example how it can do this. Checking learning without the use of technology typically involves either the teacher posing a question to the class or giving a series of questions for the students to answer on a printed worksheet. The disadvantage of the first method is that you often only get a response from 1 student. What about the rest of the class? As for the second method, the teacher has to mark each worksheet in order to see how each student is doing. Very time-consuming! 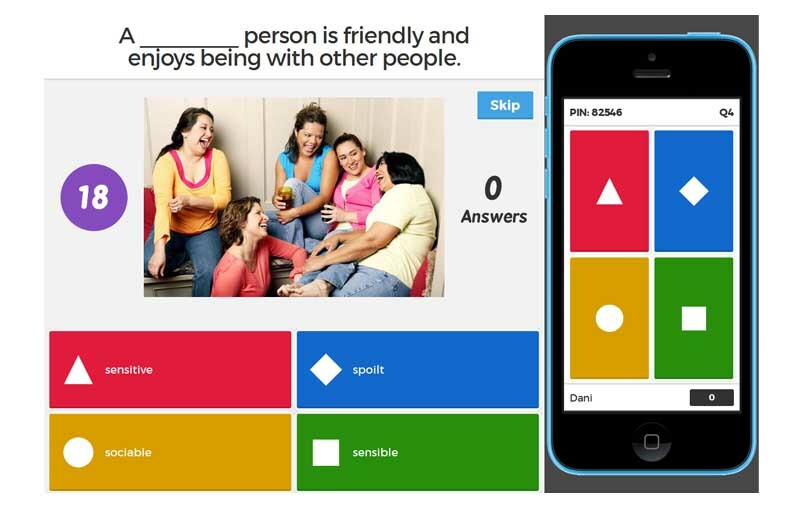 Enter real-time assessment apps, such as Kahoot! or Socrative. These are a type of BYOD app which enables every student in the class to respond to a question posed by the teacher, not just 1 student. In addition, the reporting tools attached to student response apps enable the teacher to see how each student has responded to a particular question and also how a student has performed across a series of questions. In other words, while students are engaged and having fun, they are being assessed at the same time. I’m not for one minute suggesting that learners should be constantly assessed for the sake of it, but it’s nice to know that the information is recorded and can be accessed if you want to. 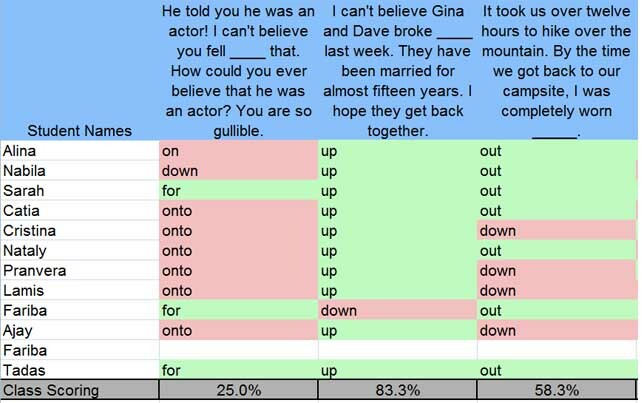 The table below is an extract from a feedback report automatically generated by Socrative following the completion of a quiz. The report enables the teacher to see how individual students performed in each question. The report also enables the teacher to identify questions which the class found particularly easy/difficult and perhaps areas that require revisiting. For example, it is apparent from the table below that the class had trouble with the phrasal verb ‘fall for’, while most of the students didn’t have any problems with the phrasal verb ‘broke up’. In addition, we can see that students Sarah and Tadas got answered all 3 questions correctly, 5 students got 2 out of 3 questions correct and 4 students got 1 question correct. Fariba somehow managed to sign into the activity twice, which is why one instance of her has not answered any of the questions! The individual pdf reports generated by Socrative on each student can also enable learners to review their own performance and review questions they got wrong.